One is Evil. It is anger, envy, jealousy, sorrow, regret, arrogance, self-pity, guilt, resentment, inferiority, lies, false pride, superiority, and ego. I love this story and I hate this story. I love its simplicity and the essential truth it captures. I love the way that it outlines in so few words so many of the helpful and harmful traits of humankind. I love that it’s a wise elder teaching his grandson the ways of the world. I love that it’s gentle yet empowering, clear yet open to interpretation. But then I hate this story because it slaps me in the face with this fact: I am “as happy as I make up my mind to be” (thank you Abraham Lincoln). I hate this story because when I’m irritated or envious, when I’m feeling sorry for myself, I don’t like to believe that I’m choosing to feel that way. Who would choose to be miserable? Who would continue to feel angry or self-pity or one of my personal favorites – guilt, if we all believed that peace, joy and serenity were within our grasp and yet we refused to reach out our hand. The truth is that when I’m miserable, I don’t want to hear about how I’m choosing my misery, I want you to dive in with me and wallow for a while until our fingertips are pruney. I want sympathy and long hugs. When I’m consumed by guilt and regret, I tend to believe that if I can just feel guilty enough, for long enough, say I’m sorry enough, and continue to whack myself over the head with the guilt, then maybe it’ll make up for whatever real or imagined crime I’ve committed. When I’m angry, I want a wing man; I want you to agree that whomever has wronged me was way out of line and therefore we will hate them forever…until we make up, and then we can all be friends again. So boiled down to its essence, I don’t always want to think that I’m in charge of my own happiness. Because then the reverse has to be true – that I am choosing my unhappiness, my pain, my sorrow. And yet, this is where I get to make a choice, take a stand for my own peace of mind, do a little renovating on the inner closets in my brain. The wolf that wins is the one we feed…there’s nothing more empowering than that. I get to choose not the external circumstances of my life necessarily (bringing to mind that infamous saying ‘When we make plans, G-d laughs’) but I do get to control what I dish up to myself. I get to control the day’s menu, and need to sift carefully through the ingredients that I cook with. It’s interesting…I pay attention what I put in my mouth and the nutritional content, but do I wash my lettuce? Do I rinse my strawberries or avoid foods with chemicals and artificial sweeteners? Sadly, not at all. There are a few items in my pantry that may contain no ingredients that I can pronounce, seemingly just chemicals and mumbo-jumbo. Probably not that good for me. And the same is true for what I feed my soul. Like so many others, I am usually my own worst critic, my cruelest enemy. I wouldn’t dare speak to even a stranger the way I sometimes speak to myself. And on those days, that is the wolf I’m feeding – the wolf of doubt and hopelessness. The wolf that is bent on devouring me from the inside out. 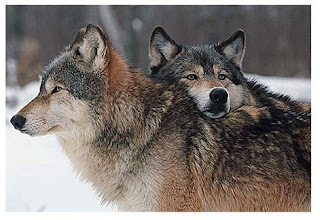 The wolf that whispers in my ear the criticisms that I have been teaching it for years. But I also know how to nurture the wolf that is generous and kind. The wolf that laughs and smiles in the sunshine, greeting strangers with warmth. I bake this wolf bites of reassurance and affirmations, nibbles of compliments and validation. I borrow recipes from my role models and family, friends and lessons from books. I fill my apartment with bright colors and sentiments of love as I strive to teach myself how to feed my body, my soul, my wolf that thrives rather than self-destructs. There are moments, sometimes days, when my evil wolf wins the war. When I can’t help stuffing him full of hardness and sharp edges, bolstering him up to stage a coup in my mind. Old habits die slowly, and my impatience with myself, my frustration that I still fall prey to choosing the ‘evil’ wolf only gives him more ammunition. Plus, I’m not sure that the wolf is actually ‘evil’. It seems that there is a place for anger, guilt, remorse, sorrow, jealousy, and self-pity. Anger can spur us into action. Guilt and remorse, used properly, prevent us from repeating mistakes or continuing to hurt the ones we love. Sorrow over a loss is proof that we had something worthwhile to lose. Jealousy can embolden us to take risks to achieve our highest dreams. And self-pity…well, sometimes we just need a good cry and to believe that we have been wronged by this unfair world before we’re ready to get off the couch and step back into our lives. So I don’t think the answer is to kill the ‘evil’ wolf. I think my ‘evil’ wolf just needs a diet – some old-fashioned weight watchers to bring it back to its right size. Maybe then, the gifts of anger, guilt, remorse, sorrow, and jealousy will be easier to access. In the meantime, I’ve got some baking to do. My ‘good’ wolf is looking a little waifish and for today, I choose to set out a feast. It’s time to sip hope, stir serenity and benevolence into the batter, lick the spoon covered in love, and collect all of the hope, compassion and faith that I can find. My ‘good’ wolf is hungry and today’s menu is infused with peace, truth, and joy. I really enjoyed reading this story and especially your thoughts on it Lauren. It just makes sense!!!! !